The pitha is deep fried and soaked in milk , it has softness as gulabjamun and tastewise so delightful . But some special tricks need to be followed to make it a perfect one . I used to see my Mom and Aunts used to knead the dough so well that their hands used to ache and the dough used to look so glossy and soft . Kneading is very important as well as frying them properly . They need to be fried in low flame for a longer period of time until reddish . Then they should be immediately thrown into warm thin sugar syrup or milk . Many directly put them in milk . Some prefer to soak them in sugar syrup first and when they absorb good amount of sugar syrup , thick , creamy milk is put onto them . I did the second method . 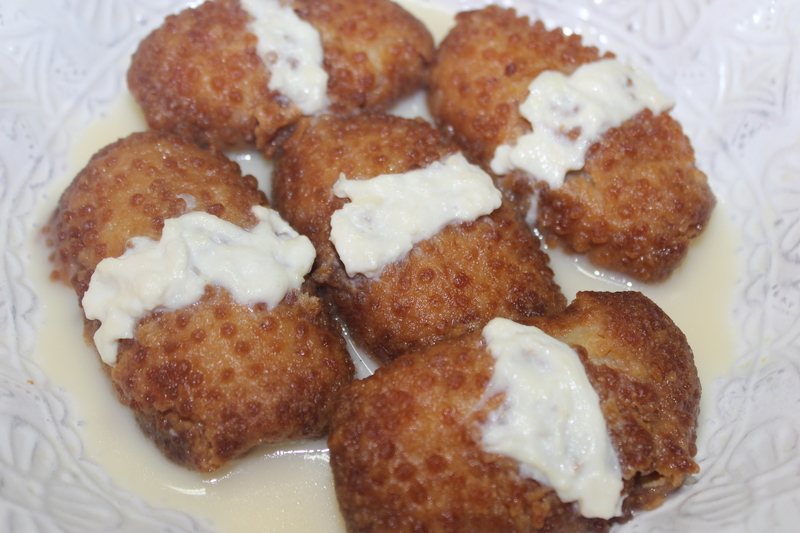 I soaked them in hot sugar syrup and when they absorbed good amount of syrup I poured thick creamy milk over the pithas . For the design , traditional way , people use the special handmade fan made of Palm tree leaves ( taaler pakha) . A small amount of dough is spreaded on it and then rolled out inward . I didn’t have the fan , so I used the strainer . You can use the comb or grater too . I’m giving you a link from youtube , that would help you to know how to make the design . I didn’t use any sugar as the sugar syrup has much sugar , but if the pithas soaked almost all the syrup then cook the milk with a piece of cinnamon stick , 2 cardamoms and sugar to taste , then pour over . 1.Make thin sugar syrup with sugar, water, cinnamon and cardamom. Set aside. 2.Boil milk. Add a pinch of salt, and flour and mix. Form dough like dough for roti or chapatti. Transfer the dough to a bowl. Knead well. 3.Add the ghee or oil.When the dough cools a bit add the beaten egg and breadcrumbs. Knead well. You may find it difficult to incorporate everything smoothly but keep kneading. You may need to add some extra breadcrumb to work comfortably with the dough. The kneading part is very important. The smoother and glossy dough you can make by kneading, the softer pitha you will get after soaking in the syrup. 4.Now make round balls and shape them . 5.Heat enough oil in a pot so pithas can be deep-fried. Now, the frying part is very important. If not fried well, the pithas will remain hard, especially in the center, even in the sugar syrup. The oil must be heated on medium low flame and it must not be too hot. Too hot oil will make the pithas get the outer color fast but leaving the center raw. The oil must not be cold either. Carefully, heat oil on medium low heat and fry the pithas well until dark golden brown. Transfer the pithas into lukewarm sugar syrup and soak them for at least 4/5 hours. If soaked well, the pithas will be soft like gulabjamun or laalmohon . If fried well the pithas will soak almost all the syrup in not more than half and hour and will be very soft . But it’s better to soak them for a longer time . Now aftr the pithas soaked and absorbed good amount of sugar syrup add very thick milk over the pithas on to the sugar syrup . If you think there are a large quantity of sygar syrup remained , then take out some of the sugar syrup then add the slightly warm milk . 6. You can garnish with malai/ cream / dudher shor . Kneading and frying is very important to soak perfectly in the sugar syrup. Knead very well until glossy. While frying, the temperature of the oil must be perfect. It should neither be too hot or mild hot. If it is too hot the pithas will go dark brown without being cooked in the center. And if oil is little hot the pithas will absorb a lot of oil and will taste bad. Therefore, oil should be heated on the same temperature from beginning to end. It should be on low medium heat and bubble should occur when you add the pithas. Remember oil should not be so hot that smoke can be seen. Also, remember to fry them with patience, with more time, so that they are perfectly fried inside out. Always put the pithas in luke warm syrup. If you put them on piping hot syrup, the texture of the pitha will be ruined. 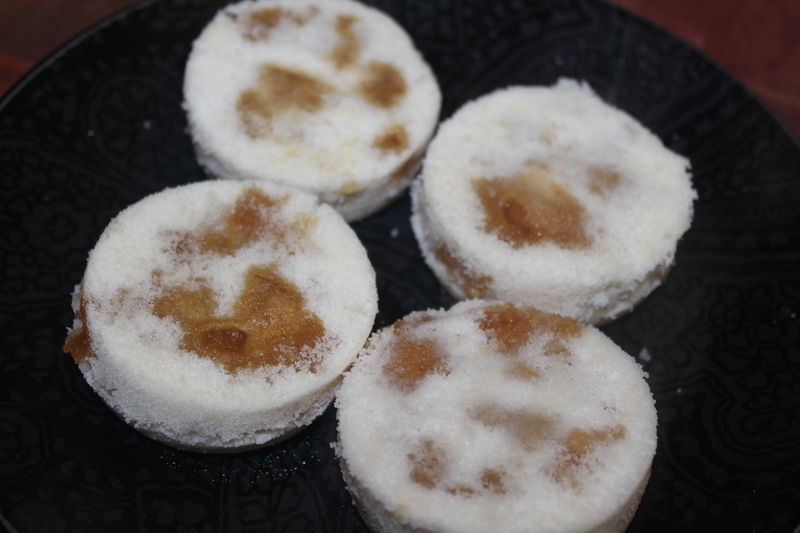 For us , the Bangali , winter is the season for “pitha-Puli ” . We have at least hundreds of different varities of pitha. Most of the pithas are either seasonal or occasional. Some are associated with harvest festival (nobanno) in winter while some others are prepared for any special occasion like wedding, eid or puja. Some are crunchy, some are steamed and some are so delightfully soaked in sugar syrup, molasses syrup , milk or date palm sap . Most of them are sweet, though there are some savory pithas too. Bhapa pitha is one of the most popular pitha in Bangladesh , made of rice flour , coconut and jaggery stuffed inside !! Surely the piece of happiness !! 1. Soak the rice overnight or at least 5/6 hours . 2. Drain the water and let the rice drained out well . 3. Now grind it in a grinder or coffee grinder . add the store bought rice flour with it . 4. Mix some water and milk . Don’t take too much . Around 1/3 rd cup . Add salt and sprinkle water+milk in a way that the flour must seem wet , not dry at all .Neither it should look like batter. Don’t add the liquid at a time . You may not need that much liquid . If the flour binds together if you hld some of them in your palm , the flour is ready . It must not be dry that it doesn’t hold together . If the flour is dry, the pitha will break apart . 5. Now sieve the flour through the stariner . Take two pieces of clean cotton cloth and two small bowls . 6 . In the bowl spread some flour , then add the coconut and jaggery . Cover it with another layer of flour . Even it . Don’t press too much or else ,it will break down while placing it for steaming . Cover it with a piece of cloth and put in the steamer. Tap the bowl slightly , so that you can remove the bowl easily . Remove the bowl and cover the pitha with the remaining ends of the cloth . 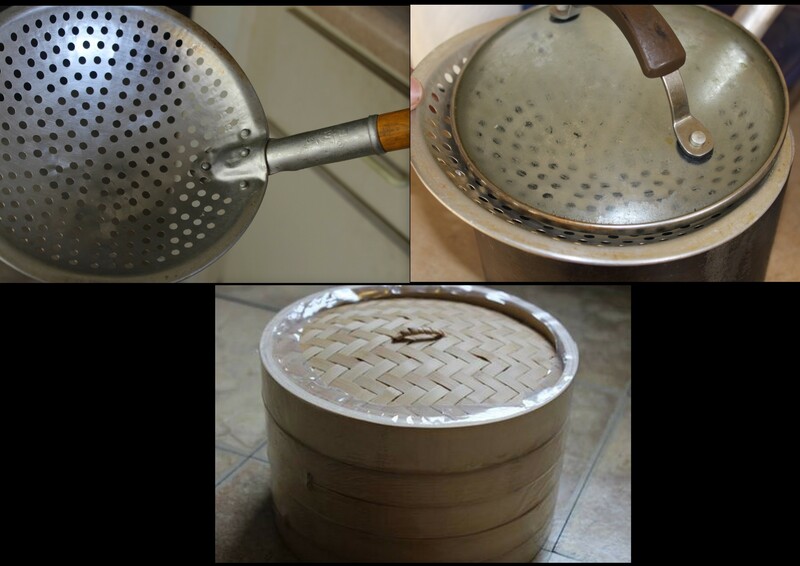 the Chinese bamboo steamer . You can do more than one at a time . Some times I just take a small saucepan with water and place a large metal strainer or large slotted spoon over it , so that it covers the face of the utensil . Boil the water and steam the bhapa pitha on it . But you must put the lid on while steaming . These are the utensils , I used for steaming . You can use any of the method . Bhapa Puli is a steamed dumpling type of very popular Bangladeshi pitha . Usually freshly prepared rice flour is used to make this pitha , but I used the ready made, store bought rice flour without any hesitation and the outcome is as same as the flour made at home . So those who are bit skeptical using the store bought flour in making pithas, don’t be . Give it a try !!!!!!!! 1. Make the filling by cooking the coconut and molasses together . Keep stirring until gets sticky . 2. Make the dough by boiling 3/4th cup of water with salt . When it’s on the boiling point, add the rice flour . Mix well . Let it cool . 3. Wet your hand and knead the dough for a minute or so . Roll a big medium thick roti on a rice flour dusted counter top . Use additional extra flour to roll it out . Cut the roti into small rotis with anything round shaped object . 4. Put filling in the center and seal the edge with your finger tip . The roti must not be too thin or too thick . It should be medium thick . 5. Steam for 3-4 minutes . Before steaming try to grease the pan , on which you will put the pithas to stem or else they can stick with the pan . Alhamdulillah my pithas turned out good , but I agree , these pithas often cracks . I think few things must be taken into consideration . 1.Dont make your roti , too thin or too thick . Both tends to crack . 2.Knead well your dough . If you use too much extra rice flour leaving it totally dry , it might crack . 3.Steaming for a longer time might crack the pithas and before steaming don’t keep it outside for too long , the air can dry out the pithas and eventually they crack .. So steam them immediately after you shape them . This is my very first guest post and it’s for a very good food buddy of mine, very talented, a very sweet but strong personality, Lail S Hossain, of With a Spin[link to – http://www.withaspin.com]!!!!!! Bangladesh, the land of Pitha-puli , has at least hundreds different types of pithas, taste, recipe varying region to region. Most of the pithas are either seasonal or occasional. Some are associated with harvest festival (nobanno) in winter while some others are prepared for any special occasion like wedding, eid or puja. Some are crunchy, some are steamed and some are so delightfully soaked in sugar syrup, molasses syrup , milk or date palm sap . Most of them are sweet, though there are some savory pithas too. Shirgoja is a traditional pitha of greater Barisal region of Bangladesh. It’s an occasional one . From childhood it has been the most adored pitha to me. Involves few techniques to make it perfect. To learn about the techniques and the recipe, please visit Lail’s blog here[link to – http://wp.me/p32LD3-1gH%5D.